Woo Hoo! Great news! We’re very proud to announce that the Aqua Initiative is now an officially registered charity in Scotland! 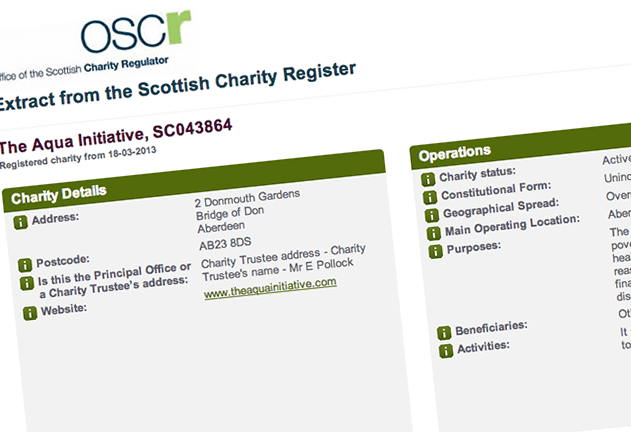 Our new, legal, charity number is SC043864! Our official registration came through on the 18th March 2013 and our launch as an official charity was on 22nd March 2013. It’s incredible to think that only a few years ago, the Aqua Initiative was nothing but an ambitious dream of a small teenager, but now it has grown to become a real charity making a difference to thousands of people around the world. The Aqua Initiative started as high school project by founder Edward Pollock and went on to arrange several fundraising and awareness events to go towards the construction of water projects around the world. As a school project in Dubai, U.A.E., the Aqua Initiative donated to projects in Kenya, Afghanistan, Rwanda, Sudan, India, Bangladesh and Ethiopia. Now, in 2013, the Aqua Initiative has moved to the U.K. ask mr robot wow . and has rebranded and registered to operate as a legal charity and continue to work to raise funds to provide access to clean water for thousands around the globe!